The full text of my Drawing International Brisbane symposium presentation is now available online. I am looking forward to a journal publication of an extended version of the paper. Meanwhile, I will be making another presentation, titled The hidden beauty: visual art inspired by Australian native plants under microscope at the 2nd Ecoarts Australis conference in Wollongong on 15 February. Will keep you posted on that too. I have just made a Spontaneous drawing from a contemporary artist’s perspective presentation at Drawing International Brisbane Symposium. Here is the PDF of the presentation (or click the image below). Once the full text is published online I will post a link here (and I am also looking forward to the extended version appearing in a journal!). The Inner Scapes exhibition, where I will be showing my recent works on paper, will be held at Woolloongabba Art Gallery (upstairs) on 15-26 September. The opening night is Friday 18 September 6-8 pm. Please come to the opening and have a look. If you cannot make it to the opening, the gallery is open Tue-Sat 9-5. If you are coming, please make sure you go UPSTAIRS, as WAG have several exhibition spaces. I have added artwork images from my current Diffusion exhibition to the galleries, check them out! And have you actually visited the exhibition yet? It will be up for another couple of months, but the works on paper are selling really quick, so don’t miss your chance to see them before they are gone. If you happened to miss my solo exhibition earlier this year, I will be showing two series of paintings from there (Moreton Island paintings and appropriation works) at Aspire Gallery ( 53 Kennedy Tce, Paddington ) on 1-22 October. The exhibition is titled In Depth: Two Journeys; the gallery is open Wed-Sat 10.30 to 4.30. The opening event is on Friday, 3 October starting at 6 PM; please RSVP to svetlana.trefilova@gmail.com by Wednesday 1 October if you are coming. For more information please see this announcement. My exhibition at Blueroom Cinebar has finished today. I hope everyone had a chance to come and see, but if you happened to miss it or don’t mind another look – most of the paintings are now displayed on My Artwork page. A new exhibition opens there next Sunday, 2 August, for more details see Mums’ Night Out on Facebook. Speaking about Facebook, I have been posting photos from my exhibitions this winter on my page there, please come and check! I am also proud to announce that my painting The Deep, the “theme” painting I used for promoting my current In Depth exhibition, has won second prize in abstract category at The BIG Art Award at RQAS Gold Coast. The Award is a once-a-year event and competition is always very strong, so this is quite a substantial achievement. 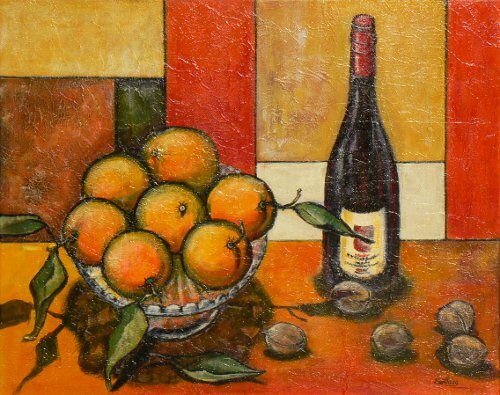 Interestingly, I put the “theme” painting from my previous solo, Celebration of the Harvest, into a monthly exhibition at RQAS earlier this year, and it came up with a “Commended” prize too!